The fifteen year eight month career of D5076/24076 was spent entirely on the London Midland Region apart from a brief six month allocation to the Eastern Region. July 1960 to Willesden (1A), on loan, made permanent August 1960. October 4th 1975 - withdrawn. 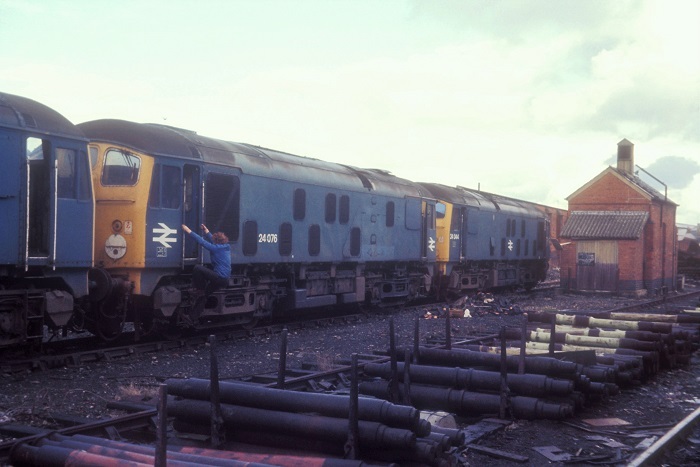 After withdrawal 24076 was stored at Crewe from October 1975 until October 20th 1976 when it was moved to Swindon Works, and scrapped there by the last week of January 1977. Noted Derby Works September 1960. Noted Derby Works February - April 1962. Noted Derby Works January & February, August & September 1963. Noted Derby Works January & February 1964. Noted Derby Works May - August 1965. Noted Derby Works April - June, November 1973. 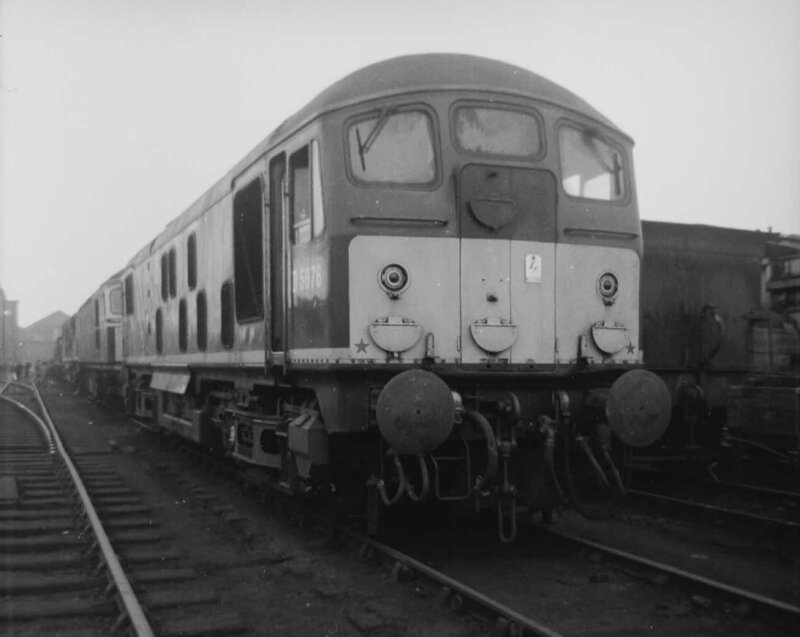 The batch numbered D5076 - D5093 were built directly following Crewe's first order for the BR/Sulzer Type 2 (Nos. D5030 - D5065). Derby would built the intervening ten, Nos D5066 - D5075. For Crewe the completion of D5093 would mark the end of its BR/Sulzer Type 2 build, the Works would then transition to the BR/Sulzer Type 4 build, commencing with the completion of D68 during October 1960. Photograph collection of webmaster D5076 at Derby Locomotive Works on September 22nd 1963. Amongst many details the bogie carries the two-rung footstep. From 1962 to 1965 D5076 was a frequent visitor to Derby Works. Condition May: green livery with small yellow warning panels with curved upper corners, fullsize water tank, shortened fuel tank. D5076 had a rough couple of days early in the year. On January 31st it failed at Canley on an engineers rubbish working to Bell Green, being rescued by D5033 from Coventry, whilst on February 2nd it passed Coventry three hours late on an early morning Stafford – Kilburn parcels, with the assistance of D298. Condition May: green livery with small yellow warning panels with curved upper corners, shortened fuel & water tanks, blanking plates in place, hand/footholds still present, exhaust located above engine room. Swindon Works, November 7th 1976, 24076 & 24044 await the cutters torch. 24076 survived to the end carrying the BR emblems on both cabsides. On December 8th the eleven coach Wirral Railway Circle 'Cambrian Coast Express' was worked roundtrip Crewe - Pwllheli by 5054 & 5076. 24076 was withdrawn on October 4th 1975. No.2 cab front: badly faded yellow paint, particularly on driver's side: noted July 1974, but repainted prior to withdrawal. BR emblems: carried emblems on each cabside panel until withdrawn.